As standard all industrial motors designed for both IEC and US system voltages/frequency supply: 400V/50Hz or 460V/60Hz. The power supply difference between 50Hz and 60Hz usually 20% - nominal power at 60Hz higher by 20% of 50Hz power supply. The data can be found on motor nameplate. The ratio of applied voltage to applied frequency (V/Hz) should remain the same to keep the same level of magnetic saturation. To keep the same thermal stress levels on the conductors and insulation, the shaft output power should also be reduced by the same ratio (HP/Hz). At the same time, be aware that operating motor at a lower shaft speed will also tend to result in a lower peripheral speed for any internal fans which in turn means both lower volume AND lower pressure for the primary coolant. Less coolant typically means a higher steady-state equilibrium point with regard to component (including winding) temperatures. The HP produced by an induction motor is directly proportional to its torque and rotational speed (HP = (torque x rpm) / 5,250). If the number of stator poles remains constant, the rotational speed of that motor is directly proportional to the frequency of the input power. When the frequency changes so does the speed, but the torque remains constant. For torque to remain constant, HP must change. Therefore, if the incoming power frequency is reduced from 60 Hz to 50 Hz (5/6), the HP will be reduced to 5/6 of its original value. If this is applied to the 10-HP motor in the example above, its output at 50 Hz would be just 8.3 HP. Even though the power required by the pump was reduced to about 57 percent (8.7 HP) of its original 60 Hz value, it is still more than the 10-HP motor can supply at 50 Hz. A constant V/Hz ratio is always maintained when a motor is under frequency converter control. When frequency is changed, the line voltage is automatically compensated via pulse width modulation (PWM). If voltage is 460 volts at 60 Hz, it is reduced to 230 volts at 30 Hz. Frequency converters that are easy to upgrade also improve productivity. A networked PLC, for example, can remotely update inverter firmware and application data through a single machine interface. If a frequency inverter must be exchanged in the field, its operating system automatically updates from the PLC. Frequency converters must be able to communicate with other devices and in many cases control entire processes. By precisely controlling process speed, for example, a frequency inverter can continuously modify throughput to meet demand changes. To coordinate more than one aspect of a process, frequency converters must be able to communicate with many devices. To illustrate, on a bottle labeling system, the frequency inverter must be able to precisely coordinate the upper level controller, bottle feed, and labeler to produce a quality product. Frequency converters are becoming more common place and more widely used in applications. They are capable of varying the output speed of a motor without the need for mechanical pulleys, thus reducing the number of mechanical components and overall maintenance. But the biggest advantage that a frequency converter has is the ability to save the user money through its inherit nature to save energy by consuming only the power that's needed. The main question now is, How does a frequency converter accomplish this? The simple answer to this question is power conversion. 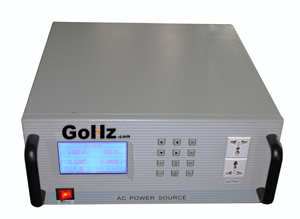 Often times those using a frequency inverter may find they need to connect a higher horsepower frequency inverter to a single phase input power source. Since most high horsepower frequency inverters only accept three phase input as a power source, they are left with few options or alternatives. Don't fret, there is a solution. If you are using a frequency inverter rated for three phase input and the only power source you have available to you is single phase input, then you can derate the frequency inverter to accept the single phase input power source. You can almost always use a frequency inverter rated for three phase input with a single phase input power source. When only a three phase input frequency inverter is available, it is acceptable and common practice to derate the frequency inverter to work with a single phase input power source. Before you derate your frequency inverter, it is most important to ensure the frequency inverter you are using is properly suited for your application. The following are some basic guidelines to help you in determining whether or not your frequency inverter is suitable for your application: Gather motor nameplate data including horsepower (HP), current (Amps), motor voltage, input line voltage and power source phase. Determine which type of frequency inverter your application will require. The type will fall under the category of Volts per Hertz (V/Hz), closed-loop vector, or open-loop vector (Sensor-less Vector). The internal components of the three phase input frequency inverter are rated for the appropriate current expected when three phase input power is applied. When using single phase input the line side current from the single phase is always higher. To "derate" is the process of ensuring that these components are rated for the higher current that will flow from the single phase input instead of the three phase input.